Introducing the new Stander EZ Fold & Go Walker, the world's most lightweight and portable walker for stress free traveling! With just the lift of a finger, this wheeled walker folds 4x smaller than your average walker, allowing you to quickly store it in your car, shopping cart, or airplane overhead compartment. The walker weighs less than 8 lbs and has the capacity to support up to 400 lbs. The EZ Fold & Go Walker has a small base and 6" swivel casters that allow the walker to easily fit through narrow doorways and tight spaces. This two-wheeled walker has a height adjustment from 32" to 38.5" to fit anyone from 4'10" to 6'8". Users will also appreciate the included organizer pouch as they run errands or take a stroll in the park. 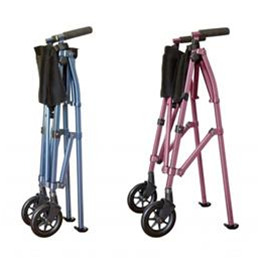 The EZ Fold & Go Walker is available in three stylish colors: Black Walnut, Regal Rose, and Cobalt Blue.